Admit it; hammering away a nail is a hard and draining job to do. It could be the reasons why you’ve been putting that home renovation projects you’ve been planning since last year. Just the thought of it is exhausting enough but with the rise of nail guns, not anymore. You can now finish your projects efficiently and also comfortably. There are different types of nailer that specialize in a certain job. One of this is the Hitachi NR90AES1 For once, a framing nail is very handy to have in your toolbox. The framing nailer is the heaviest duty nailer out there and one of the essential tools in any home building site.When used properly, a framing nailer will help you get that woodworking job in less time. It often requires up to 3½” nails to join 2×4’s, To name one brand with a great nailer, here’s Hitachi. This framing nailer is lightweight and also durable making it ideal for jobs, around the house or even heavy duty jobs. another advantage of this tool is the safety features are beyond just good, after going through basic safety precautions you can work with ease. Working with this power tool also doesn’t make you suffer from a noisy workplace; Compared to gas-powered models the tool is quiet. In addition, The driving modes allow you to work in any setting. On top of this all, it can be bought at a very affordable price! So now, the disadvantage of this tool is alongside the pros are a few minor cons. Since the nailer only uses plastic collated nails which cannot be densely packed unlike the wired ones, it requires more frequent loading. Another drawback of this tool is that it does not work well under hot weather condition since intense heat causes the nail gun to jam. Without a hanger hook, it keeps sliding and falling thus it is advised to buy it separately since the kit doesn’t come with it. Read the Amazon reviews of individuals who had taken the right decision and also bought this Hitachi nail gun. If you’re still hesitant on getting this nailer, the reviews might help. “I am building a garage this summer. My main comment is I wished I had bought one of these years ago. Now the challenge is to stay on top of the ammo supply. I keep running out of nails, but those would have been used anyway. It is just that we go through the work much more quickly. It did jam but Hitachi told me to drive a steel into the blade to unjam it. I used a drill bit about the same diameter and tapped it with the flat top into the blade. It worked just fine. The machine is large and takes some getting used to. I do still struggle with handling it whilst up in the roof trusses. 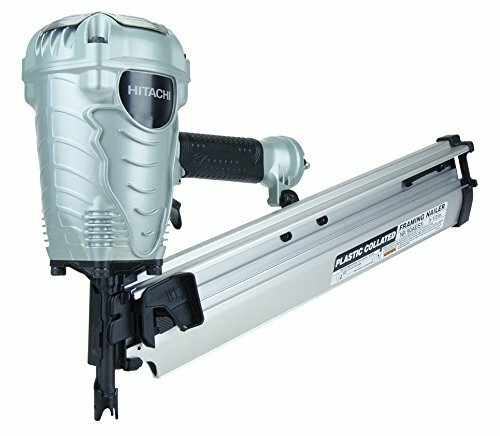 The Hitachi NR90AES1 Framing Nailer is a competent nailer that is ideal for use in various settings. Irrespective of whether you need to do simple tasks around the house or get professional work done, this power tool delivers. It’s packed also with various safety features and is suitable for beginners. It’s lightweight and also comfortable to hold. So whether you are an enthusiastic handyman or a fully-fledged carpenter, you could do with this nailer in your toolkit. Don’t spend hours hammering away wasting time and energy, when the Hitachi NR90AES1 Framing Nailer lets you work smarter rather than harder.